There really are same fantastic fleeces in stock this season. Whether you're looking for a shooting fleece or a casual country fleece, The Country Catalogue has something for you. Top of our range has to be the Musto Melford Fleece Jacket in either the ever popular Dark Moss or Navy. Tiny air pockets in the high loft fleece fabric retain body heat and the draw cord hem traps heat inside the fleece jacket. The Musto Melford Fleece Gilet in Dark Moss is also available for both men and ladies. If you're looking for something on a budget for the ladies, The Country Catalogue recommends the Baleno Sarah Fleece Jacket. Baleno Sarah Fleece Jacket is lightweight and breathable which can be worn independently or under a shooting jacket. 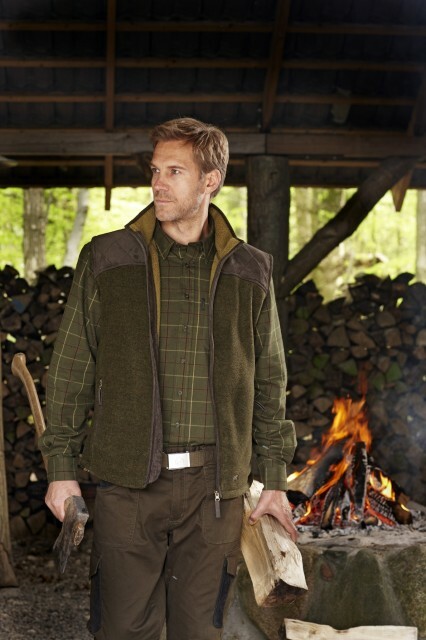 Ideal for shooting, hunting and other outdoor pursuits as the fabric is warm and comfortable. If you're looking for a gilet alternative, The Country Catalogue stocks Baleno Sally Fleece Gilet in Brown. For the men from Baleno, The Country Catalogue stocks Baleno Harvey Fleece Gilet and Baleno Henry Fleece Jacket. You may want to take a look at the Seeland William Fleece Jacket for men also, a classic looking jacket with amaretta quilted shoulders and reinforced zips and elbows. Comfortable and smart with a soft pile fleece inside, it features two zipped pockets and has an adjustable drawstring at waist if required. Seeland William Fleece Jacket is perfect to slip on at the end of a shoot day. The Country Catalogue also stocks Seeland William Fleece Waistcoat as an alternative. From one of our most popular brands: Alan Paine, The Country Catalogue stocks two products from the Alan Paine Aylsham range, the Alan Paine Aylsham Windblock Waterproof Fleece Jacket available in "Green" and the Alan Paine Aylsham Gents Fleece Waistcoat available in "Bordeaux". The Alan Paine Aylsham Windblock Waterproof Fleece Jacket is an excellent waterproof and windproof fleece jacket which is fully lined and has a smart trim to the zip area and collar. The Alan Paine Aylsham Gents Fleece Waistcoat is the perfect fleece for either layering or wearing over a shooting shirt or country jumper. Made from 100% polyester it has a soft, luxurious feel and is sure to keep you warm & cosy. Not forgetting the little ones, Seelands Coby Kids Fleece is the ideal for layering in the winter under a warmer jacket or brilliant as a camo jacket in its own right when the weather's not too cold. The fleece is lightweight, soft and comfortable and it has two zipped side pockets and an adjustable drawstring at the waist.